Otapahi, purchased by the Trust in 1997 when it had 7 hoiho nests, is not open to the public. The reserve has seen hoiho nest numbers increase to a high of 32 (2008). However, following several events* numbers have reverted to the earlier number of 7 – 9 nests. Revegetation work to improve the quality of the penguin nesting habitat has been undertaken since the purchase. Between 1998 and 2000, about 1,800 trees and shrubs were planted annually. These plantings were funded primarily by the Pacific Development and Conservation Trust (an organisation set up by the French Government in recompense for the Rainbow Warrior sinking in 1985) and the Department of Conservation Biodiversity Condition Fund, and the plants were grown in the Trust’s Nursery. Trees and shrubs are protected with netting cages and maintained with herbicide spray for a minimum of three years. By this time, they are usually able to out compete the exotic pasture grasses, which are the main obstacle to success for many restoration projects. Trapping, undertaken year round in the reserve and on neighbouring farmland, seems to have benefited the titi/muttonbird, which has established a small colony in an area adjacent to the reserve. 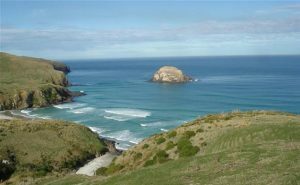 *In early 2013 there was a mass mortality event, assumed to be caused by an unidentified toxic agent which killed more than 70 adults and juveniles on Otago Peninsula. This was followed by many chicks starving in December/January of 2013/14 requiring intervention in rehabilitation centres, straining resources and requiring tonnes of fish supplies. More than 55 penguins were maimed in suspected barracouta attacks from January to April 2016. These events have had an impact on hoiho numbers on this reserve, resulting in lower numbers of breeding adults annually.